Outkast have been in the game for beyond a decade now! Over the years, they have released five critically acclaimed LPs, including 2003's "Speakerboxx / The Love Below", which featured a complete solo disc from both members. Around the release of their third LP, 1998's "Aquemini", Dre and Big Boi decided to expand on their names with their very own recording label. Also titled Aquemini, they introduced the world to two of Atlanta's greatest emcees in Slimm Calhoun (2000's "Skinny") and Killer Mike (2003's "Monster"). They also introduced the world to Sleepy Brown. With Dre moving closer and closer to the big screens of Hollywood, Big Boi has now decided to cut all dealings end all dealings with the title Aquemini! Enter Purple Ribbon! 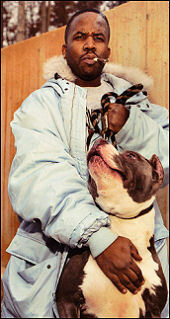 Referring to the history of dog breeding, and with Big Boi being heavily into breeding dogs, the label has now been renamed Purple Ribbon Records. Already boasting rapper Slimm Calhoun and Bubba Sparxx, he expanded to now also feature fellow ATLiens Konkrete, who have been featured on many of Outkast's prior tracks. Also featured on the label is r&b singer Scar, and Bubba Sparxxx, who is best known for his previous two albums with Timbaland's Beat Club Records. With such a diverse setting, Big Boi is now ready to show the world what they can do as a unit! Everyone has their own respective following, and they all have what it takes for superstardom. We had a chance to catch up with Big Boi, Killer Mike, Bubba Sparxxx, Scar, and the members of Konkrete to talk about the future and what's to come over the next few months! Clearly, these guys are a family unit, and together, they're set to take over the rap game once and for all! MVRemix: First off, you made such a big name of Aquemini. Why did you opt to change the name to Purple l? Big Boi: That’s because it’s no longer an Outkast thang. It’s my own label. I wanted to rename it Purple Ribbon! They got to know the history behind it, you know, when you breed dogs! It’s like three generation of Purple Ribbons. My artists got history and lineage behind them. MVRemix: Besides Bubba Sparxxx, Killer Mike, Konkrete, and Scar, who do you have on the label? Big Boi: Sleepy Brown, and my sole pretty girl Jonell! MVRemix: What happened with Slimm Calhoun? Is he still rolling with you guys? Big Boi: Yeah, he is, but he’s just on hiatus, getting his music together. I saw him yesterday actually. MVRemix: You do so much work on the side with Goodie Mob, and you guys have been so close throughout your careers. Had there ever been a thought to bring them into your label and work at bringing them back to the success of their heyday? MVRemix: Ok, because like many of the fans, I miss the old days when everybody was rolling together in a tight clique. MVRemix: So the first release is Killer Mike? Big Boi: Yes, and it'll be out later this year! MVRemix: What are things looking like for Outkast? I know you were finishing up your movie “My Life In Idlewood”. When is that set to hit? Big Boi: Naw, that’s just a temporary title. We finished up the soundtrack, so we’re trying to get the movie out by the end of the year…. MVRemix: Are you planning to expand your acting career further by doing more movies? Big Boi: Oh no, I’m still going to be doing movies. I’ve had a lot of offers, but every film I do, I want it to mean something. MVRemix: It seems like every time you see an artist running their own label, their artists never get the exposure that they truly deserve. On the contrary, Killer Mike did exceptionally well with your backing on his first LP. What was it that you did to ensure his success? Big Boi: It really was with him man! He’s got a great personality, he’s a dope lyricist, and he’s talking about something. He knows how to get out here and take to people. By me and Dre taking him out everywhere we went, you know, he won a Grammy before his first album came out. The first album went Gold. We just try to keep him grounded. We tell him don’t worry about what you just did, but worry about the future. MVRemix: You seem to be doing more now than you were at that time. Do you feel that all of things you’re doing as an artist and an actor are going to interfere with you running the label? Big Boi: Oh no, because I got a tough team behind me. When I ain’t here, they take care of everything. I get behind the desk sometime, but my heart is on the stage. MVRemix: What’s going on with you as a solo artist? Big Boi: I’m working on my next album right now. It probably won’t be out for about three years, but I got a jump on it already. MVRemix: You recently did the “Got That Purp” mixtape. What made you travel that avenue? Big Boi: It was coming up. Just a way to hit the streets and let the streets know what’s happening. I wanted to put out some new music, and you don’t want to have to wait on the label to put together a schedule and all, so the mixtape is just for the streets. We got a good response, so we’re about to put out “Big Boi Presents: Purple Ribbon Allstars-Got That Purp Vol. II” on September 30th. MVRemix: Now that will be sold everywhere, or just online? MVRemix: Anything we can look out for from you besides the label stuff and your movie? Big Boi: Killer Mike's album later this fall! The 1st single is “Chrome” featuring myself. Also got Scar, he’s a soul singer on the label. We got a compilation coming out, and me and him got a song called “U Got Me”. A song called “Kryptonite” features me, Konkrete, and Killer Mike. That’s going to be the second single off the compilation. Bubba Sparxxx is finishing up his album, and me & Dre just trying to hammer out this soundtrack! MVRemix: I’ve had a chance to get with many of your artists today, and what I like is that it truly seems like one big family unit! Big Boi: That’s exactly what it is! You know, a lot of these catz been down with the Dungeon Family for a decade or better. MVRemix: How about a website? Is there one, or is there one in the works? Big Boi: Yea, they building it now man! My assistant showed me stuff last week, it’ll be Purple-Ribbon.com. It’ll be up probably in the next thirty days or so…. MVRemix: Any kind of final comments at all? Big Boi: Just to all the fans, everybody out there that supported Big Boi, Outkast, and everything we doing, we just love y’all, and we just going to keep putting our best foot forward. If it wasn’t for them, it wouldn’t be no us. So we going to stay on the grind, and we doing it for them! "They got to know the history behind it, you know, when you breed dogs! It’s like three generation of Purple Ribbons. My artists got history and lineage behind them."